Lily Luján likes her chanclas, they fit her feet perfectly, they clack clack when she walks, and more importantly, they are part of her identity. 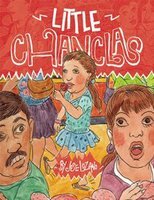 Little Chanclas, by José Lozano,celebrates the individuality of one little girl and her tireless clack clacking. Like most developing children, Lily has found something she loves, something that is comforting and uniquely hers; in early childhood development speak, that’s called a “Comfort Object”. Developing a dependency on a Comfort Object is pretty common among preschool-aged children and helps them cope with the changing world around them. Sometimes the Comfort Object is a blanket or a teddy bear, but for Lily it is her CHANCLAS. And chanclas are totally Chicano. Chicanismo is the the political terminology which sets the parameters for Mexican-American nationalism. The word, Chicano, was developed as a term of self-identification highlighting the political, social and cultural differences between American-born Mexicans, white Americans and Mexico-born Mexicans. Chicanolandia is a world of virtuality; of not fitting in on one side or the other, and this book, Little Chanclas, not only holds the language of Chicanolandia (panaderia [bread shop], Burgerteria [burger shop]), but it also contains unique cultural markers (Lily gets through the year full of quinceñeras, and countless parties). Lozano seamlessly tells the story of a little girl who loves her shoes, but he also accurately develops the atmosphere for Lily. This book doesn’t pander, attempt, misrepresent or stereotype. Cinco Puntos Press did it again! They are giving children of color an opportunity to self-identify with Little Chanclas. The readers or listeners will understand Comfort Objects because they have them, and now they can see that thing they know presented by a child who shares the same skin tone as them. And that’s damn important. By omilaju in Bilingual, Girl Protagonist, Hispanic Latina Child on April 4, 2015 .